The following text is a transcript by F.F. of Jonathan Bowden’s lecture to the 35th New Right Meeting in London on Saturday October 15, 2011. In editing this transcription, I introduced punctuation and paragraph breaks. I also deleted a couple of false starts, added the first names of some figures, and added a missing line to “Easter, 1916.” You can view the lecture at YouTube here . Two words (one of which occurs twice) are marked unintelligible. If you can understand them, please post a comment below. I’ve been speaking on a range of writers during the last couple of meetings of the New Right. We’ve done T. S. Eliot; we’ve done Ezra Pound; and this time we’re going to do W. B. Yeats, who was born in 1865 and died just before the outbreak of the Second World War, in 1939. Now, it’s slightly ironic that we’re doing Yeats given that General Wilson figured earlier in our particular build up, because of course Yates is of course an Irish nationalist. Although hardly the house poet of the IRA, he was associated with the Irish national movement throughout most of his life, even though he was English by blood and Protestant by religion. He became a senator in the Irish Republic as it then was, or had just become an Irish Free State before, in the late 1930s. 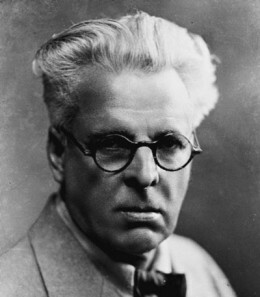 Yeats won the Nobel Prize for literature in 1921. The Nobel Prize has increasingly become a politically correct designation now, in the last 20 years. But some worthy people have won the prize. Some great people have been overlooked, like Leo Tolstoy. But Kipling was given it. And W. B. Yeats was given it. Now Yeats is an arch-conservative or a paleo-conservative writer in many ways. His career spans at least three phases. The first is concerned with transcendentalism and a traditional attitude toward European culture and civilization. The middle period is a much more personal and idiomatic poetic. And the last period brings back the mental, the theoretical, and the metaphysical themes and is really the coping stone of his career. Yeats was strongly influenced by the belief that the Celtic peoples of the British Isles should revive and was strongly influenced by Young Ireland, which was a sort of parallel to the Young England movement that existed in Victorian times in 19th-century England. Yeats was born into a family of artistic practitioners, and his brother, Jack B. Yeats, was a famous painter in Ireland in the 20th century. To understand Yeats we will have to understand something of the background of Irish politics and society during this period, the obverse of the Unionist tradition. Irish nationalism had many strands. A large number of southern Protestants were actually always involved in it. And it looked back to Wolfe Toneand the republicans of the 1790s. However, the republican tradition is only one tradition within that particular milieu which Yeats could be said to favor. Yeats had an aristocratic vision of society, and he believed that money was the curse of modern culture and that money destroyed and broke down the organic unity between man and man, and persons within a particular national community. He believed that the Cromwellian vision of the Puritan state in 1600s England was something to be resisted, and he believed that only a restoration of an aristocratic sensibility—as against a mercantile, materialist sensibility in relation to culture—would see European art and letters thrive in the 20th century. The Wikipedia entry for Yeats—which is quite long and quite interesting, particularly about his private life and his relationship with the fiery Irish nationalist and literati Maud Gonne—mainstreams him, really, and regards him as an establishmentarian figure. But he was always a much more radical figure than that. The Marxist poet W. H. Auden always despised the occultism and the mysticism and the spiritualism with which Yeats was concerned. Yeats deeply believed in something which he regarded as the “race soul” of each independent and separate people. And he strongly believed in the power of the unconscious. He believed that individuality and the romantic cult of individuality, which indeed prospered very much during the 19th century, was overplayed artistically and that what an artist had to do was to go down into semi-, sub-, and unconscious parts of the mind in order to bring up the wellsprings, the tropes, and the archetypes of a particular people, in his case, the Irish people. He was responsible for the creation of the Abbey Theatre with John Millington Synge and with other people. And the Abbey Theatre is the main artistic and experiential theatre in Ireland, still going in a differentiated sense, under state patronage to this day. It is, essentially, the quasi-national theatre of Ireland. He wrote a large number of plays, and Yeats was a prolific writer all of his life, in poetry, in prose, and in incidental writing. Yeats was sought out by Ezra Pound, who has been the subject of one of my previous talks, and Pound became his secretary for a while. Pound said he was the only writer in that period that was worth emulation and was worth seeking out to that end, although they had a bit of a falling out because he insisted on editing the rather overblown, prosodic Victorian verse that Yeats was then producing. Yeats’ phases as a poet are instrumental in many ways of Irish life. Irish life responded to the famine by emigration in the 1840s and 1850s, gradually began to adopt a more nationalistic course in the 1860s and 1870s, which took the form of parliamentary Irish nationalism linked to English liberalism. As always, the liberal or Left-wing part of a nationality favors those doctrines which are less nationalistic and, in British terms, less Unionist. This is why Gladstone’s great transformation, when he believed in the 1880s that Ireland should be given home rule within the Union, was one of the most contestated issues in the Victorian period of that time. The violence that has characterized Irish politics in the 20th century was born in the 19th century and was born in particular by secretive, elitist, cabal-like organizations in the United States such as the Irish Republican Brotherhood which were created out of the Fenian movement. The Fenians were created in Chicago in 1859, and members of the Fenians fought on both sides of the American Civil War, for either the North or the South. There are famous moments where Irish militants met under a green flag because they couldn’t have met under a unitary American flag, divided as that sensibility then was, into the Confederate and Unionist or national unity zones. Now, the Irish Republican Brotherhood re-transplants itself as a paramilitary, squadist, and terrorist organization—a vanguard nationalist organization in its own surmising, of course—back to Ireland during the latter part of the 19th century. The Irish Republican Brotherhood links with Griffith’s organization, Sinn Fein—which in Gaelic means “ourselves alone”—in 1908. Now, Griffith was Welsh and was Protestant, and he led an extraordinary number of eccentrics, willful charlatans in some respects but also opinionated idealists, often of a quite crankish sort involved in Irish Republicanism well up to and including the Rising. The Rising—which occurred in Easter 1916 against British rule in Ireland and which involved the capture of nearly all of the Rising’s nationalist leaders and the execution (bar the odd individual such as Eamon de Valera) of almost their entire number by the British—was a period of soul­searching for Yeats. Yeats never identified with the working-class and lower middle-class aspirations that fed that wing of the nationalist movement. His belief was always that democracy was an ill-fangled and new-fangled and rather pejorative coinage which he didn’t wish to see introduced to Ireland, into Britain, or anywhere else. Yeats’ most controversial political and metapolitical soundings were in the 1930s, when he associated, albeit tangentially, with the Blueshirt movement, as it was called, or Civic Guard in Southern Ireland, which is the nearest you had to a mainstream, quasi-fascistic movement in what would become the Irish Republic but was then the Irish Free State. To understand the importance of Eoin O’Duffy’s movement, at that time and the near civil war conditions that existed throughout Southern Ireland which had of course, experienced a civil war in the 1920 between the two wings of the IRA, you have to know a little bit about the Irish history of the period. Eoin O’Duffy was the deputy commander of the IRA against us, against the British, in the Anglo-Irish war as we called it, between the crushing of the Rising and its aftermath in 1916-17 until the Anglo-Irish treaty in 1921. The Anglo-Irish treaty established the Free State throughout what is now Southern Ireland or Eire. The Free State was very much a hybrid and very much a compromise which nationalist ultras on the Republican side could never accept, and Michael Collins who was the undisputed leader of militant Irish republicanism and was then leader of the IRA, was killed by his own side and by the De Valera or anti-treaty wing of the movement, because he’d signed the peace treaty with Lloyd George. After his death, a savage war was conducted with far greater ferocity than the war between ourselves and the IRA, between 1917 and 1921, involving Black and Tans and everything else. When they fought with each other all the gloves came off in the sense of ex-comrades violating the bed they’d both shared. Eoin O’Duffy became the leader of the pro-Free State forces, as they were called, and the official IRA or the official wing of the Eire state that used crushing military force, particularly the use of artillery in concentrated fire to break the anti-treaty IRA. The anti-treaty IRA lost the war and won the peace, because of the political party they set up, Fianna Fáil, which means “Soldiers of the Nation.” Can you imagine a British party called “Soldiers of the Nation” holding power in an undaunted and unideological way for most of the century? Yeats’ attitudes towards Southern Ireland were equivocal, because although a mystic, who was drawn toward occultism poetically and who had all sorts of literary, ideological axes of his own to grind, Yeats disliked Irish “Popery,” if you like, despite very clerically-based southern politics that looked to the Catholic Church for all answers, as a post IRA. Fianna Fáil tended to do. They allowed their moral authority and their social compass to be governed, in the south at any rate, by the dictates of the Roman Catholic Church. That role of the Roman Catholic Church as the axillary rulers of the Irish republic—without being involved in day-to-day legislation but by providing the grid within which the state operated—largely existed until about 1980 when Ireland remained a conservative and in Western liberal terms, socially backward republic. Yeats had supported O’Duffy’s Blueshirt movement by writing three odes and three marching songs, some of which were used by the movement. The movement emerged out of the need to confront the IRA, which, in the south, was re-vivified in the 1920s by De Valera’s accession to the Irish Taoiseach or premiership. In Irish politics the president is a purely nominal position, although having certain symbolic power and importance. All power is concentrated in the Taoiseach or premier. Parliamentarians are known as “Deputies of the Dáil,” T.D.s. O’Duffy decided on the non-revolutionary course. There was a moment when there was a march on Dublin, in which many people saw in the Republic or Free State as it then was as a parallel to Mussolini’s “March on Rome.” The movement was much closer to Mussolini’s indeed than to other European societies. Their use of the blue shirt had St. Patrick-type associations, and you had to be a Christian, a professing Christian, to be a member of the Blueshirts. Massive Blueshirt rallies occurred all over the northern part of the Irish Free State. Parts of Southern Ireland, of course, are actually further north than parts of Northern Ireland. Northern Ireland is the dispensation that the Unionists carved out for themselves out of six of the nine counties of Ulster. Ulster is nine counties, but they couldn’t keep the nine because the population would then have been 50% Roman Catholic, 50% Protestant or reformed faith. And Carson and other Unionist leaders at the turn of the 20th century felt that this was unsustainable, so they reduced Ulster to six counties in order to hold Belfast and to have a separate British state on Irish soil which has existed in a quasi-independent manner within the Union through their own version of devolved Unionist assemblies in Stormont until the beginning of “The Troubles” in the late 1960s. Yeats believed politically in the Protestant minority in Ireland, which has always been extraordinarily culturally important as a culture­bearing strand. Most of the great Irish writers are Protestants, and they are the cultural minority of the Irish Republic as a whole. Twelve percent of the population was Protestant when the Free State was formed. It’s now about one or two percent. Of course in relation to marriage with Roman Catholics, if you intermarry your children become Catholic otherwise the marriage has no formal existence in Catholic terms, and a Catholic can’t marry a Protestant, certainly in a country as socially conservative as rural Ireland without that being acceded to. Now, I once went into a pub in Dalston, in Hackney, in inner London, and if you know anything about Dalston, within which there were large riots recently, Dalston is now part of Africa, essentially. However, this pub was an Irish pub, a traditional shebeen where literally where you had sawdust on the floor. And on the wall there were photos, some of them very old, brown sort of tourist type photos, of all the great Irish writers and intellectuals. Now, you can bet your bottom dollar that the topics of conversation in that shebeen was not about Irish writers and intellectuals. But the reason they were on that wall is pride. Self-pride. Rejection of the Irish joke at the colloquial level. But also, the insistence that these individuals are vanguard minds for the nation. It’s why we have pubs called Shakespeare, after all. And all of these great writers—Synge and Sean O’Casey and Samuel Beckett and Oscar Wilde and George Farquhar and Yeats and James Joyce and so on—most of them were Protestants from the ascendency class. The reason that they provided a lot of the intellectuals is because they were the elite class that ruled under British patrimony. You needed an elite, upper class that was drawn from the Irish population but was largely put into the country by the first Elizabeth the better part of 400 to 500 years before. The Irish-Irish had fled and provided quite a few of the generals in Napoleon’s armies and in other French armies and were yet part of another part of the endless waves of Irish emigration, which, given the multiple Irish economic collapses of recent years, has re-begun. We all remember stories of the so-called “Celtic Tiger” where large numbers of people Irish extraction came back, now the reverse process is occurring, and they’re filtering out again. The Civic Guard movement emerged from the pro-Free State or pro-regime IRA, which was tacitly backed by both the British and the Northern Unionists. There have always been surreptitious links between the more moderate, less anti-Orange tradition that Fine Gael now represents in Southern politics and Unionism and British national identity. It’s always the case that people seek symmetries in cross-border disputes given the large number of people who live in Britain of Irish ancestry, two million of whom claim to be Irish four-square and even have documents of the Republic’s derivation. This means that there is an intense interest between the nation-states. Enoch Powell once delivered a speech in which he said that the two million should be forced to decide whether they’re British or not. But there’s a degree to which the close interrelationship between British and Irish identities and the complicated nature of the relationship whereby tens of thousands of Irishmen volunteer to fight in Britain’s wars, particularity the First and Second World War, both through love of fighting and through a residual relationship with Britain. The core Southern Irish attitude towards Britain is very complicated and is nuanced and is probably a love-hate relationship, to be frank. There’s often a very strong social identification between English and Irish people. But there’s an ideological hostility amongst the Southern Irish to the British state, as such. There are also considerable tensions between Northern and Southern Ireland, and you have a strange relationship between the two northern communities, that are daggers drawn with each other, and yet are often politically aligned against southern interests within the same society, fractious as it is, into two nation-states and with two separate identities. Half of the population in Northern Ireland—which the Catholic minority always call “the north of Ireland,” they will never call it Northern Ireland—of course, looks to the south, or to a northern version of the south, to represent them in their own politics. So the complicated and multifaceted nature of these intra-Celtic relationships, never mind the relationship between Scotland and Northern Ireland, and Scotland and Irelanders per se, are all part of this particular broth. Now O’Duffy’s movement had a choice, after most of the IRA prisoners in relation to the civil war in 1920-’21 and ’22, were released by De Valera. De Valera opened the prisons and let out most of the squads and most of the men who fought on the anti-treaty side and been locked up by the party of the Free State and its allies in the 1920s. This led to a radicalization of Irish politics as these militants came out again, and the IRA began to organize all over Ireland. The IRA had Sinn Fein as its political vehicle, not Fianna Fáil. Fianna Fáil tried to keep the IRA and Sinn Fein at arm’s length, but they were heavily influenced by them and by their militancy and the division in Irish politics in the late-1920s and early-1930s was between the party of the Free State on the one hand—which became Fine Gael—and its quasi-paramilitary wing, the Civic Guard or Blueshirt Movement of National Unity led by Eoin O’Duffy the former deputy IRA commander in the war against us and the former commander of the pro-Free State IRA against De Valera’s IRA, which engaged in a lot of killing, particularity extra-judiciary killing, killing of prisoners and so on. Once they caught their old comrades there was no mercy shown on either side, thereby proving the point that civil wars are always the cruelest, because the people involved are so close together, when they split, there’s no mercy on either side. Now, O’Duffy called off the Dublin march, and there were large marches in other provincial cities such as Cork and so on. And probably that decision saved the quasi-Republic from actual violence and a second civil war within a matter of years of the first. Had he not called off that march, it is debatable what would have occurred, because a large number of the police, of whom O’Duffy was the ex-commander, would not have fired on the Blueshirts, and might have led to a situation where De Valera’s government was toppled by force majeure and a corporatist Ireland, of a sort, which O’Duffy’s movement advocated, would have come into being. To this day, members of Fine Gael in Southern Ireland are called “Blueshirts” and even call themselves Blueshirts. Members of Sinn Fein loathe Fine Gael, and Fine Gael loathes Sinn Fein in a sort of intra­community rivalry which is often difficult to understand from the outside. That’s because the polarity of the type of politics that was represented was national. But don’t forget that nearly all of these people, in one form or another, came out of the IRA, all of them! Even Collins, who was ex-commander of the IRA, don’t forget. Irish politics in the 20th century came about because of violent vanguardism, not the democratic, ameliorative, and bourgeois type of politics. The politics of the Irish Republic might be said to resemble that now, certainly given their economic difficulties, but that certainly was not the case earlier in the 20th century. Karl Marx said in an essay in the New York Times in the 1870s that a lot of Britain’s revolutionary energy was displaced into Ireland. And in terms of certain of revolutionary energies that took national and communitarian forms, that’s partly true. Certainly, Britain has had a quiescent political history despite marginal movements of radicalism in fulfilment. But the mainstream has remained solid, high-crusted, bourgeois, and unbroken for most of the 20th century. And even today most people can only think of the dichotomy Labour-Tory, with the Liberals in the middle coming in between the two. Whereas in Ireland, revolutionary politics—even in relation to the present Northern settlement—has largely been the order of the day, and tiny little vanguard movements were able to graft themselves on in a semi-conscious way to much larger social and cultural forces. This is why Yeats’ cultural or metapolitical discourse is so significant. Because Yeats always believed that artists and intellectuals were the key components of a community in how it talked to itself. And yet of course in themselves they are isolated individuals. How do they overcome the sea of isolation that differentiates themselves from other members of their national population? By plugging into the national myths and to the aboriginal cultural inheritance of the society and the people from which they come. They then become a custodian of the racial and emblematic nature of that society and are representative of its culture bearing stratum in a very real and visceral way. It’s by having ideas like this that links Yeats to European nationalist writers and artists going back to the Romantic period across western and indeed, central, northern, and southern Europe—and Eastern Europe as well. So Yeats is seen by liberal critical opinion as an ultra-conservative and slightly and tangentially fascistic cultural figure who is part of this movement of thinkers and writers and idealists who dreamed of a different type of Europe and a different type of national societies. He chose Ireland, basically, as the basis of his dreams. He was involved in a lot of occult and mystical lodges, the Theosophical Society and above all the society of the Golden Dawn in Britain during the late 19th century. And these explored, basically, the subconscious archetypes and mythical facts of a people which can be dredged up and made fit for purpose by their great artists and intellectuals. Yeats believed that you had to communicate to people in a way they could understand. And in the 20th century that will take two forms. It can take the forms of commercial art and the market which drives things down to the lowest common denominator, clears at a point of commercial reference, and is all around us. The “culture industry,” as Marxists call it, is the culture you will see when you go back into Victoria later this evening after these talks. Yet the culture that many of these European idealists wanted to establish in Europe between 1920 and 1950 was of a quite different sort, it was a more reactionary, ancestral, racinated and rooted type of culturalization that looked back to the past but also looked forward to the future. Yeats believed that all of the Egyptian rituals of the Golden Dawn should be replaced in an Irish sense by Irish mythical figures, warriors, and various circles and cycles of legendry. Just as he believed language and culture were cyclical, he believed that historical processes were cyclical, long before Spengler’s ideas became fashionable at the end of the First World War. Spengler, of course wrote Decline of the West which appeared in German in 1918 and seemed to strike a resonance across the cultured part of the European population, a book of extraordinary depth and complexity and Byzantine dexterity and size, which is about thisthick and sold 100,000 copies in its first edition because people really did believe that a decline had come. Just as Yeats didn’t believe in humanism or progress as an amelioration of the peoples, but in identity and the causation of morphological change. He believed in aristocracy and the absence of democracy. He also believed in eugenics. One thing that you won’t see in the Wikipedia profile of Yeats was his membership in Britain of the Eugenic Society from about 1910 onwards. Eugenics was partly a Left-wing movement at that time of what would now be called sociobiology. It’s very interesting to note that many of these ideas born from the natural sciences and from the biological sciences had an enormous heyday in the early part of the 20th century, the ’20s, ’30s, and ’40s, then dipped down, almost to semi-visibility within the establishment, within academic and literary life, and have only been revived in the last 30 years with the mapping of the human genome and with the mainstream processing of genetic knowledge in the late or the new biology. Even to this day, biology and social ideas, sociological and political ideas based upon biological norms have to be incredibly careful of being tainted, as is perceived, by the political associations of things like eugenics and the links to the radical right, that eugenicist policies evinced in the late-1930s and thereafter. So Yeats had a range of these ancestral ideas of a romantic, spiritist, and metaphysical sort. But he wasn’t beyond getting his hands dirty by joining something like the eugenics movement. Yeats’ poetry, as I said, can be divided into three separate areas which largely correspond with his life. The first was strongly influenced by the Celtic Dawn revivalists of the 19th century and Irish Ossian-type myths. The second phase is a more personal diction, when he attempts to interpret these myths in a manner which is more recognizable from the perspective of men and women of his era. And the third stage, towards the end of his life, the late 1920s and 1930s, is an attempt to merge those strands—the theosophical and metaphysical with the more personal and the immediate. As with all great poets, many of his words have come to enter into the language, and of course he’s one of the greatest English-language poets of the 20th century. Collections like The Green Helmet were world famous when they were produced and led to his Nobel Prize. He saw the Nobel Prize as a gratification of Irish liberation as he perceived it. He believed that Irish man and woman, that Irishness was being celebrated by giving him the prize at that time, and there’s no doubt that literature is an outrider to the souls of peoples, and there is a degree to which prizes are given politically for great weight. When Solzhenitsyn was given the Nobel Prize in the mid-1970s, no one doubts that that was being played out within the symmetry of the Cold War between American and Soviet blocs. Similarly, when African and Eurasian and Latin American authors are given the prize today, no one doubts that these are, in part, statements of political preference and the desire to appease new blocs which are emerging and new countries which are having a minor state on the global stage, the new Brazil, the new South Africa, the new Chile, and so forth. Yeats changed his attitude towards the Republican movement as part of Irish nationalism with the Easter Rising in 1916. Patrick Pearse, who was one of the leaders of the Rising, was a quite major poet in Gaelic. He was shot like all the others. Indeed, those who were wounded were put on stools so they could get a good firing range at them. De Valera—who was a mathematics lecturer in prior life—was one of the few not executed and would later emerge, of course, as the leader of the political forces of the anti-treaty IRA which became Fianna Fáil and that became the government of Ireland. Until relatively recently, 46% of people in the Irish republic used to vote for Fianna Fáil, this large Irish-Irish, unideological party that basically stood for the national community and the residual strength of the residual Irish Roman Catholic Church. Nevertheless, an enormous amount of corruption and boss and gang type politics—which has always been part of Irish life, and always been part of Irish communities in North America and Australia—was also part of the Fianna Fáil axis. This came to its apogee with the leader and Taoiseach Charlie Haughey, the richest man in Ireland who paid no tax and was a remarkable and sort of shamanistic individual, the “bosses boss,” the “boss of all the bosses,” the slightly ludicrous and caricatural formulation of this “boss” politics that stretched to the cities of Australia and stretched to the cities of North America. If you remember Mayor Daley in Chicago was very much part of this “boss culture,” always on the Right-wing of the Center-Left party, which is where Irish immigrants of all generations have always found their patriotism in new societies to ally. The truth is that many people in Britain of core Irish descent find it difficult to totally assimilate to the national tradition, although some do. But they’re not Left-wing people at all, so what they do is they agglomerate to the edge of the labor movement, this sort of anti-communist, hard social democratic wing of the Right-wing, the Eric Chapel wing within the unions and elsewhere, of the labor movement, particularly in Australia where certain elements of third way type politics, on the margins of the Right of the Center-Left have often been quite paradoxical, quite corporatist, and quite far-Right or ultra-Right in their leanings due to the inevitable social conclusions that can be drawn from certain Catholic ideas. As an aside, Mayor Daley is very amusing, because when the anti­Vietnam War protesters had their great protests in Chicago at the Democratic convention in 1968, Daley beat up a journalist on national television with a stream of the most extreme expletives, all of which were played over the media with no sound but with voice going. And he beat this journalist up, hitting him in the face, hitting him in the stomach, hitting him again! Daley was the boss, you see, and he’d been insulted, and this is how politics was often dealt with, in these back-room type shenanigans that Irish political cronyism and “boss politics” introduced even into the Right-wing of the Labour Party in Britain and well beyond. Now, someone like Yeats had a much more elevated view of Irishness than that sort of stew in the cities of the diaspora across the Western world. But there’s a degree to which a passionate Celtic identification with idealism, with a transcendental set of idealisms, and with a transcendence even of those perceived limits is a part of his poetical diction and part of the Celtic imagination. It’s no surprise to me that in the present circumstances, Welsh, various forms of Irish and Scottish nationalism within the UK and British­wide context are much more prized than English nationalism, because they’re white minority forms, and because they can be allowed a certain space because they’re also relatively unthreatening in relation to the demographic as a whole and because they also make an insistence. One of the most successful movements is the Welsh language movement which began from a tiny little base and in relation to a language which by the 1960s in the principality was truly dying and has now been revived, and every document in Wales from the smallest to the highest is bilingual. So it shows what can be done, culturally through cultural struggle if a militant minority has a mind to do it. I remember a Radio 4 program about five years ago in which they dealt with respected poets from the different parts of the British Isles. The poet from Northern Ireland was an Ulster-Scots linguistic grammarian who was writing in a variety of local diction; he was a sort of oralist, if you like. The poet from Scotland was a Gaelic poet from the northern highlands and islands, who was speaking a minority Celtic language. The Welsh poet was an Anglo-Welsh poet who wrote both in Welsh and English, of an Iris Thomas type of extraction. The English poet who was chosen was a black lesbian from Brixton in central south London. Why was that done? It was done because, in a way, these Celtic formulations could be given their head and could be treated with a certain amount of respect, almost part of a museum of culture if you like in a way. Whereas if you ask the question “Who is English?”—and poetry does answer the question about what a people is and who it is. Because when people have agony in their lives, if they have disease, or if they bereavement, or if they have war, or if they have social strife, the response of a large number of people—maybe not millions, but hundreds of thousands of people—is to write verse. People who face the prospect of dying in a battle the next day will often write verse. And the reason that they do that is because it is a musical intensification of language and feeling. Now, if a people is borne to write verse in order to testify to the immediacy of an experience, they are also liable to state their identity through that heightened language and through that heightened experience. And when you begin to ask “Who is something?” “Who are the English people?” “What are the English people?” “Who is English in this room?” “Who is English in Victoria now?” you are beginning to approach the topic of who is not. And that negative dialectic plays very badly because, of course, everyone can presume to be British under present jurisprudential standards, where you are British just because you have a passport to say that you are. But English is more problematical because it involves licenses of blood and idiom and identity, and it’s the same with Irishness, it’s the same with Welsh, and is the same with Scottishness. It’s the same with even more minority identities such as the Cornish one or the Manx one or the residual identity in the Channel Islands. Or the differentiation between highland Scottish identity and that of mid-belt Scotland, for example. Or the difference between the Welsh-speaking Welsh identity and the English-speaking Welsh identity, the difference between the Welsh-Welsh, as they are called, and the rest. When you get into these complicated, mosaic-like peelings away of nationality and identity you’ll realize that the British Isles have a thriving multiculturalism of their own, long before mass Third World immigration. You don’t need mass Third World immigration to have multiculturalism, because we speak a large number of languages just on our own, and diversity of the white population is one of the intriguing aspects of facets of ur-textuality and of ur-nationalism as I would perceive it. And yet it has always been widely ignored, except by liberals who often express a surrogate national feeling through reclaiming white national minority figures. That’s why Celtic culture is so officially prized in the England and post-Britain of today. Because it can be permitted and because such people are militant minorities. It’s also true that the Celtic people of these islands have been militant about their identity, and there is a species of militancy that exists that is part of that identity. Even parties as tame as the Scottish National Party and as tame as Plaid Cymru do have, at their base, a far Right accretion. To return to Ireland and the topic of Yeats, when Eoin O’Duffy refused to march through Dublin and confront the IRA and the De Valera state in a manner which could have led to internal and civil strife, with Britain in the background and without a republic ever being formed in Ireland, he turned away from the prospect of civil war. He also turned toward democratic politics because the part which opposed Fianna Fáil, which is called Fine Gael, was a merger between parties which then exited and the Blueshirt movement. So, if you like, he took his movement off the streets—he was an ex-police commander, after all—and merged them in with other political parties. This is why Ireland never experienced a second civil war in the 20th century. Now, Yeats’ political contribution was tangential and didn’t really occur until he entered the Irish senate in the 1930s. Like the House of Lords, the Irish senate has never been elected. It’s appointed and is appointed by the government. This led to quite a lot of upper-class Protestants being appointed to the senate by the patronage of the republican elite, or the softened republican elite, because, by that time, the Fianna Fáil elite were well in power and had their feet under the collective desk, the militancy and fire of the IRA was a generation or so back, and they were mainstream bourgeois politicians looking after their own interests, indistinguishable from most other figures, particularly in the low countries and elsewhere. Now, one of Yeats’ most famous poems concerns “Easter, 1916.” I’ll just read a bit of it. I always think that you have to adopt an Anglo-Irish accent to get the best out of it, but we will see! The phrase “a terrible beauty is born” has entered into the language of the 20th century, rather like the fact that he also considered history to run in cycles, and he considered that the Christian age was coming to an end in his cycle of life. It would be a 2,000-year culture. This has a certain prescience because as the organized expression of Christianity as a civic faith, certainly the Irish Anglicanism that he was brought up in, the Church of Ireland has largely died out in the country whose existence he supported. Partly as a result of the policies of some of its governments. Another phrase that has entered into the mainstream of the language. The last two lines have largely entered into the English language in the 20th century. “And what rough beast, its hour come round at last, slouches towards Bethlehem to be born?” So even in the early middle of the 20th century Yeats believed that great social, national, cultural, racial, and other forces were being unleashed—unleashed all over Europe and beyond. And the point of great artists was to elaborate on the nature of that unleashing. He sees individuals like himself as the sort of lode stars of the people, that they are the communicants, that they are the voices. It’s very much like in old Nordic culture where the poets were singers and reciters of song, whereby you had the entire collective experience of the tribe internalized by a songsmith, essential. Somebody with a lute, somebody with a harp, somebody with what we would consider to be a primitive guitar would play Beowulf, who would give out a threnody like an epic poem at a gathering where others would be silent or would drink or occasionally would join in. They were communicating the racial essence of the people in the room back to the people in the room in a way which was conversant with something which they could understand, and also that each performance would be integral and yet different, because the next night, due to the improvised nature of the performance, at least in part, the diction would be slightly altered. This is why there aren’t necessarily many textual models from that period of history. Although Beowulf has come down to us, we believe, by a Northumberland monk and been preserved. But the tradition had an oracular element to it. In Nordic culture it’s called the skald. It’s this idea of illumination and intoxication that seizes you and which is a form of language. Speakers who are good or great speakers, who don’t use notes, who speak in a mediumistic way, often talk about “hearing the voice,” and this is part, in some ways, of that tradition, whereby certain things which are internal to you are communicated to others, and in the bond of that communication there is an alliance that speaks to the rational part of the mind, but also speaks to the irrational part of the mind. Men can be moved by feeling and by emotion rather than reason. The great power of the Right is that it can move people emotionally, which is why it’s everywhere repressed because the danger of such movement, the danger of such emotional transformation, the danger of such an invasion of self and purpose is there for all people to see. In this society now, as you’ll see as you go back into Victoria, our attitudes toward things are almost everywhere absent. But the very fact that they are everywhere absent, is a clue to the possibility of their potency. Because there are only two tendencies in modern British and other European and Western life that can’t be integrated. They are foundational religiosity of one sort or another and the radical politics of identity. They are the only two things that can’t be adapted and assimilated into the marketplace, into the 24-Hour Video, Tesco, Shopping Bay culture. They are the only two things that cannot be integrated. Would they if they could? There probably would be an attempt to do so, if it could be done by hybridizing the more moderate people, by saying “so-and-so is moderate,’’ “so-and-so is an extremist,” even within an allegedly extremist area, by inculcating dialogue with the moderates—or populists—in order to differentiate them from the more hardline. Maybe something like that would be attempted if there was the belief that such a tendency could be assimilated. But the whole point is that now with mass immigration, with the transformation of European cities out of all recognition from what they were even 30 years ago, such assimilation is impossible. People will either look to what exists now as a portent of the future they wish to rebel against, or there will be a general decline, an entropy. Decline into the obverse of civilization, into an anti-civilizational or de­culturalized sub-structure of a sort that people like Yeats would never have realized. In 50 years’ time, if immigration into Southern Ireland continues at its present rate, the Irish will be a small minority in their own land. When you bear in mind all of the violence and the vigor and the sort of anti­British blasphemy and apostasy that the republican movements engaged in for over two centuries to wrest control over a relatively small country and to put a vanguard in, in order to lead it, against the more preponderant power within the British Isles, all of that will be for nothing. What was it all for? What as all that blood and energy and rancor and specious rhetoric and sort of blarney for, if you find that even within your capital city in 20 years’ time you are in a minority? What was it all for? Similarly, if we focus on the greater extent and to our own society, in Britain now, what is this 2,000 years? What is the empire and everything that went with it? What were the two world wars of the 20th century all for? We have just become a “community” within our own island which has become a sub-section of the overall, communitarian absences of privileges which generally exist. What is the purpose of this country and its history if all we’ve become is just one group among the others? The white British, just one segment of the taxonomy of peoples that’s delivered every ten years with the census. Just one part of the population, as indeed White Americans are becoming. Obama’s election is just a signification of the fact that White Americans are in a minority in Texas now, a minority in New York a long time ago and a minority in California very soon. The truth of the matter is unless we go back to that Irish pub and we look at the wall and we look at the great iconic figures that are on those walls, on those murals of identity if you like. There’s a mural in Reading which is a “Black Power” mural. It’s on the side of a particular club, which is now defunct actually. People need their icons, and people need their murals, and people need their myths, and they need people to articulate those myths in ways which leads to a heightened sense of self, a heightened sense of being, and a heightened sense of sensibility. Music and poetry are interlinked because, of course, a song is really poetry set to music, and poetry enables people to cut through prosody, to cut though the detail, and to invest language with emotion. And it remains a very powerful tool. And it’s also of incredible importance to my way of looking at things that many of the greatest artists of the first half of the 20th century, but not the second half, had political opinions very close to some of the speakers earlier on in this meeting today. There is a reason for that, and the reason is that they wanted their cultures and they wanted their nationalities and they wanted the civilization that all European cultures are a part of—they wanted that civilization to revive. Irish and British people have fought with quite considerable violence against each other at certain times in the last 150 years, and yet both are part of the same civilization. We are all part of a racially based civilization which we have given the world. White people are now 10% of mankind, basically. If we are to prevent ourselves from becoming smaller and smaller and less and less important we must revive these cultural figures, we must cleave them to us, and we must make sure that the iconography of their photographs and what they represented remains before us as we go forwards into the future. On a tube train in central London, to read Yeats is a very, very minor form of rebellion.